Loteria Mobile Deck is the iPhone and Android companion to Loteria Workshop. No more need to cut out your Loteria Workshop Card Deck from paper sheets, just print your playing boards and use your Phone as your digital card deck. Easy to use just like a real paper card deck, it contains the 54 images included with Loteria Workshop. To play just touch the SHUFFLE button once or several times then to announce the cards touch the button NEXT. 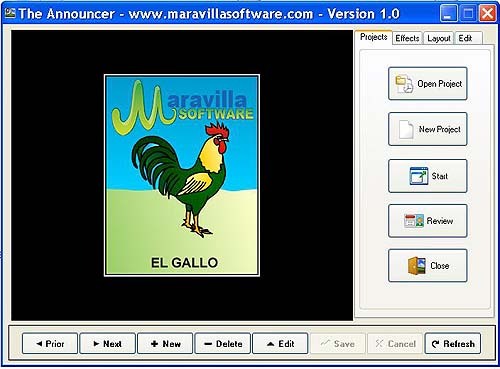 The Announcer is a free slide show generator that can be used to call out Loteria or Bingo games. User can create different projects with images and audio. Download The Announcer program and the sample project. To stop the presentation press the key ESC then right click and select Minimize.